Sometimes it just needs to feel like home. I love to prepare new foods. People always ask me if I have favorite recipes that I reach for time and time again, but the truth is that I’m usually so excited to try something new that I often forget to save time (and stomach space) for the flavors and recipes that I loved in the past. Particularly as it pertains to baking, I regularly find myself so inspired by the treats I see sprinkled all over magazine pages and the internet that it’s all I can do to stay on track enough to revisit older cakes, pies, and cookies that I’ve made before. Still, there are times that you just want a recipe that feels like home. Those comfort food recipes, the ones that taste like you’re eating them off of your Nana’s plates or in the company of your Mom and Dad, are often the ones that nourish you all the way down to your soul. For me, those comfort recipes include strawberry shortcake, my Mom’s baked spaghetti, and even soft-serve ice cream cones. I love peanut butter and honey sandwiches, McDonald’s French fries, and even that runny ranch dressing that you can’t buy in a bottle but always seems to find its way on your plate at diner restaurants. 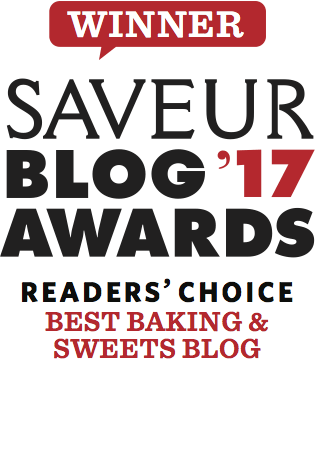 Those flavors, completely unsophisticated and no-frills, are the ones that taste like home to me, and no amount of shiny new recipes and 5-star meals will ever replace those. I have a feeling you might have similar stories, no? So I made this banana cream pie cake for my husband. Always the pie and cookie lover, never the cake guy, I wanted to create a simple and summery recipe that would give nod to the banana pudding he grew up eating in his Nana’s kitchen. He tells the story that, as a kid, his nana would scoop bowls of pudding for all of the grandkids before supper. The goal was to sneak into the kitchen early to stake a generously poured bowl with the most vanilla wafers. I never met his Nana, but I like any lady who left my special guy with a full belly and loads of memories. To be fair, this is not banana pudding. 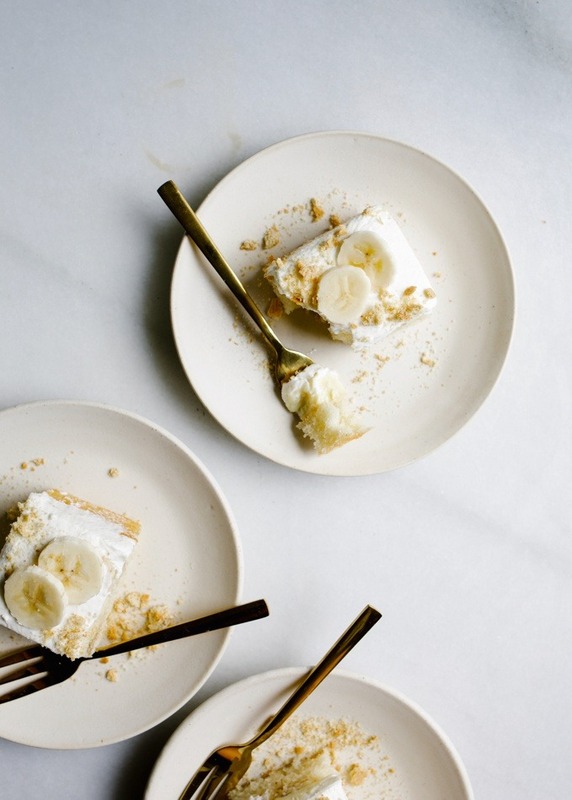 This banana cream pie cake, a white sheet cake topped with sliced bananas, pastry cream, and a fluffy layer of fresh whip, is really a modernized shout out to the pies and puddings we all know and love. I wanted a simple dessert that gave love to the flavors of yesteryear, and I think we accomplished that here. 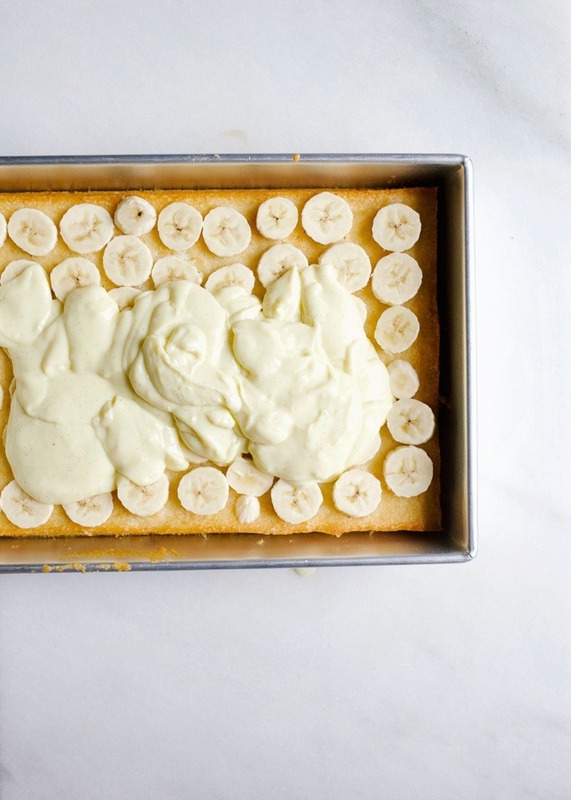 To make banana cream pie cake, we start with the sheet cake. 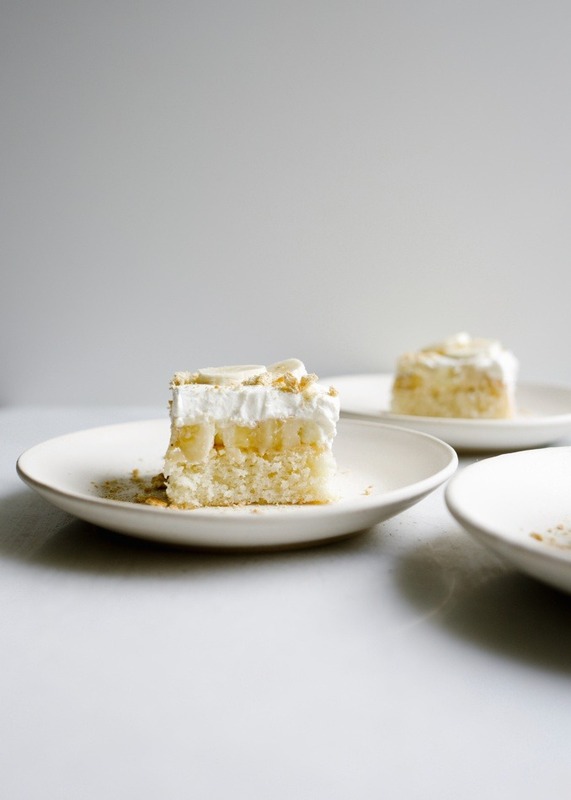 This simple, fluffy white cake can be made in a basic 9″x13″ pan. 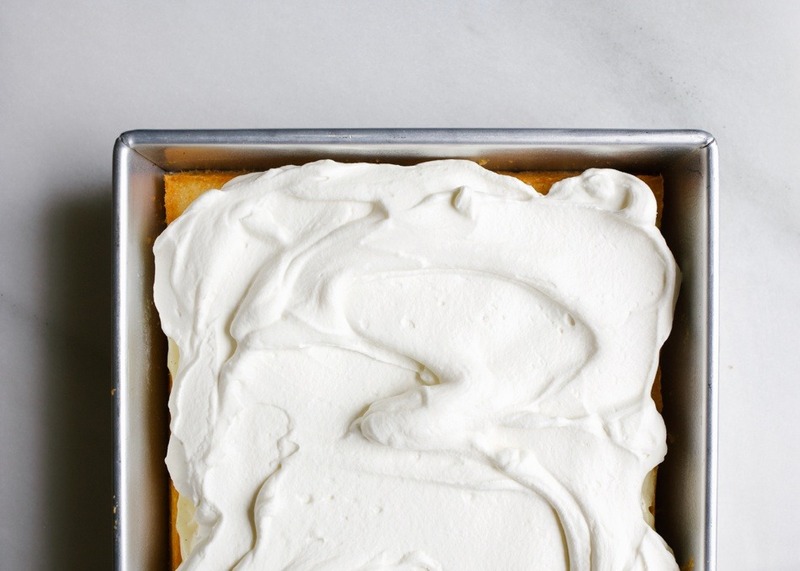 In a pinch, reach for a box cake mix here, because, seriously, who even cares? Once the cake is cooled, layer with a few sliced bananas and whip up the pastry cream. Eggs, milk, and a fair share of sugar get cooked on the stove top until thick and smooth. The mixture gets spread all over the cake and left to chill in the fridge. 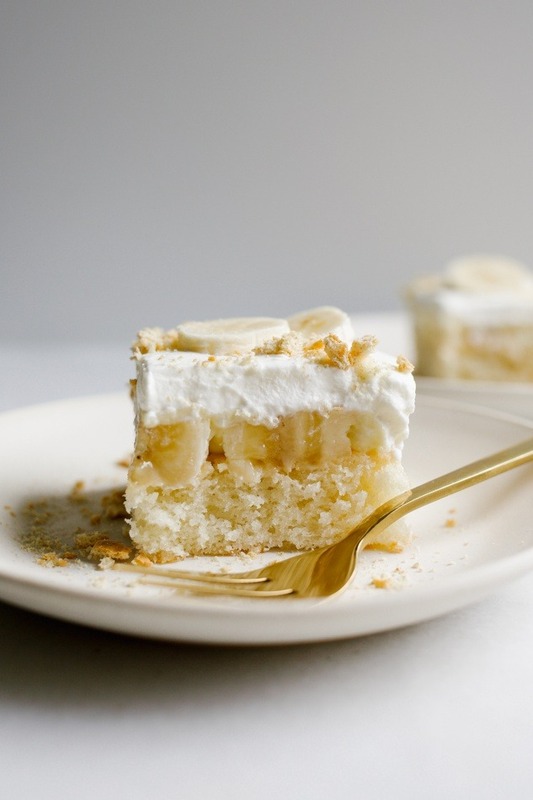 Once cooled, top the banana cream pie cake with a thick layer of whipped cream. From there, you can keep the cake in the fridge until ready to serve slices to everyone on the block. Yes, this cake will feed a crowd! 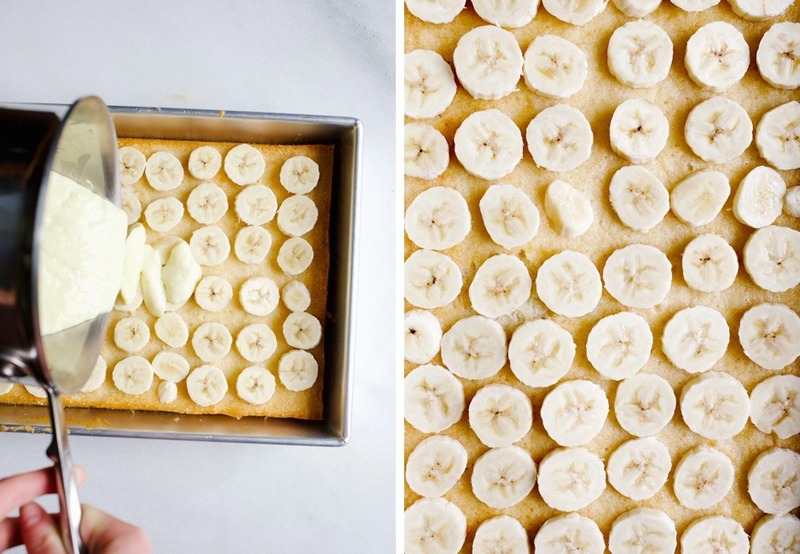 I like to top each square with extra banana slices and maybe even a sprinkle of nuts or vanilla wafers, but you can do as you please. Just make sure you have loads of friends to share it with. No matter what feels like home to you, I’d encourage you to make it sometime soon. 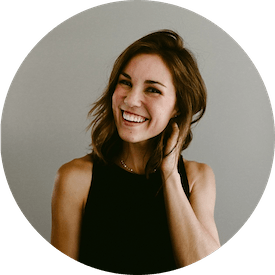 I think we learn a lot about the people around us when we share the things that cut us deep, and let’s be honest- food is always a big deal at home. So share it with the people you love. Happy baking and happy weekend! This banana cream pie cake is a white sheet cake topped with fresh bananas, vanilla pastry cream, and whipped cream! All the flavors of your favorite banana pudding and cream pies in a simple sheet cake that serves a crowd! Preheat the oven to 350 degrees and prepare a 9×13” metal baking pan with baking spray. In the clean bowl of a stand mixer, using the whisk attachment, whip the four egg whites on medium-high speed until stiff peaks form. Scoop out of the bowl and set aside while you prepare the rest of the cake. Using the paddle attachment in the bowl of the same stand mixer, cream the butter on medium speed until smooth, about 1 minute. Add the oil and sugar and cream until light and smooth, about 2 minutes. Add the vanilla extract and stir to combine. In a separate smaller bowl, stir together the flour, baking powder, and salt. Add half of these dry ingredients into the butter mixture and stir on low to combine. Add the milk, stirring to combine, followed by the remaining dry ingredients. Stir on low until well incorporated. Use a rubber spatula to gently fold in the egg whites until well incorporated, being careful to not overmix. Spread the cake batter into the prepared pan and bake until toothpick insereted comes out clean, about 20-25 minutes. Take care to not overbake as the cake will be dry if so. When done, remove from oven to cool all the way while you prep your pastry cream. In a medium saucepan, combine 1-1/4 cups of milk, the sugar, and salt. Cook over medium heat, stirring regularly to bring to a simmer and dissolve the sugar. In the meantime, in a separate bowl, stir together the remaining ¼ cup milk with the cornstarch, flour, and egg yolks. Whisk to combine and set aside while waiting for the milk and sugar mixture to simmer. Once the milk and sugar mixture is barely bubbling, remove from heat and slowly pour it in a small and steady stream into the cornstarch mixture, whisking vigorously. Continue streaming in while whisking until all the hot milk has been incorporated and then return the whole lot of it back into the saucepan. Whisk constantly over medium heat until barely bubbling and the mixture has thickened to a mayonnaise consistency. Remove from heat and stir in the butter and vanilla until smooth. Immediately move to assemble the cake. Space out a single layer of thin banana slices on the cooled cake. Pour the hot pastry cream on top of the bananas and use a spatula to spread it all over the top evenly. Try to keep it on top of the cake instead of falling off the sides. Place a single sheet of plastic wrap directly on top of the pastry cream and place in the fridge to cool, about 30 minutes. Once cool, pour the heavy whipping cream into a large bowl or the bowl of a stand mixer. Whip on medium speed until slightly thickened and frothy. Add the sugar and continue whipping until stiff peaks form. Carefully remove the plastic wrap from the top of the pastry cream and spread the whipped cream over the top of the entire cake. 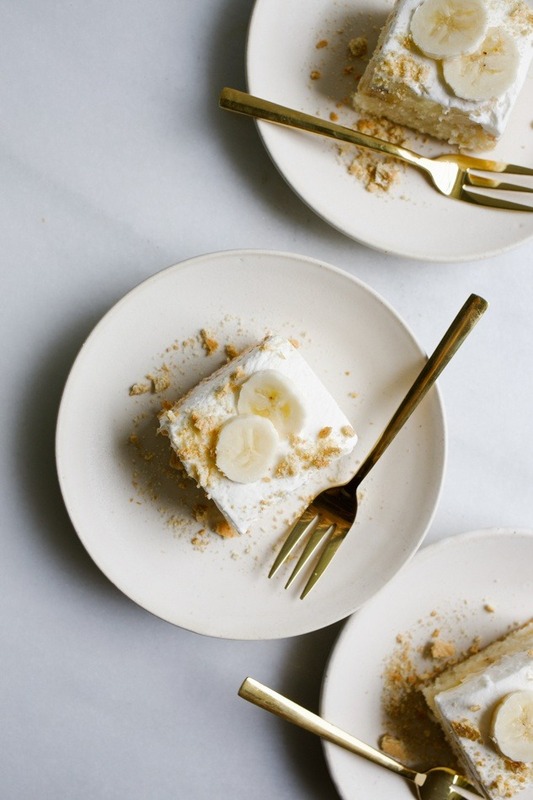 Serve immediately with additional slices of banana or a crumble of graham crackers. Use extra bananas, if desired. As a shortcut, use a box cake mix! Can I make this a day ahead and just keep it in fridge? Yes, but keep in mind that this type of cake will dry out easily, so be sure to not overbake! I am going to make this cake this week! Banana cream pie is my absolute favorite! Oh hooray! I hope you will! omg YES. Give me all the red velvet! YES! Oh thank you for sharing, Michelle! Happy birthday to you! Totally understand your ways; I always try to make a certain twist and go one step further …… tend to forget good old tried ones …… Thank you for this one ! Enjoy the day ! I already was in love with your awesome recipes before but this recipe is above all. I can’t wait to run to my kitchen and prepare this banana cream pie right now. I really hope it turns out the way you have it in the pictures. I’m gonna comeback and let you know how it turned out. Oh this just warms my heart! thank you for the kind words! This looks like the kind of recipe I need to make very soon! Thank you! Oh, I hop you will!